A recent paper by Andrew Latimer and myself was just published in Global Change Biology. 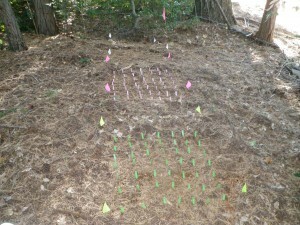 We conducted an experimental transplant of two invasive brooms (Scotch broom and Spanish broom) across a range of canopy closure at Blodgett Forest, and manipulated snowpack for three years, to investigate how interactions between disturbance and snowpack might affect plant invasions to higher elevations under climate change. 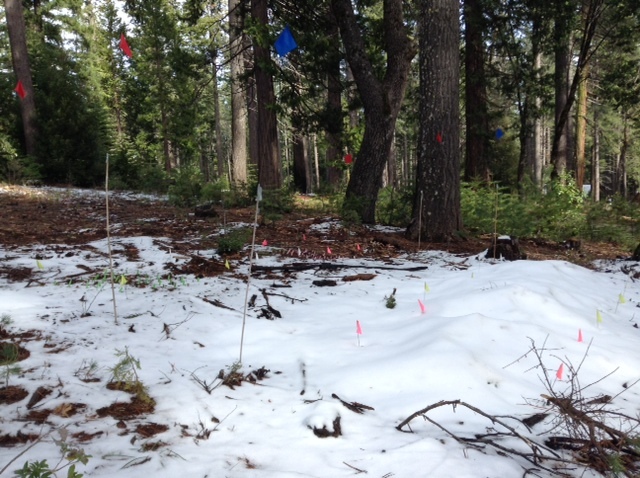 We ran demographic projections on these populations using a mixed-effects regression model to compare the range of lambda values, and found that population growth rates for both species increased under reduced snowpack because of negative effects of snow depth on seedling survival. 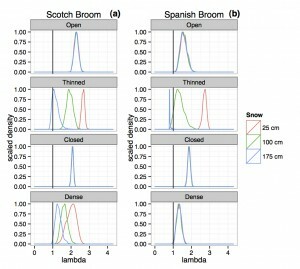 Density of simulated values of population growth rate (k) for Scotch broom (a) and Spanish broom (b) under 12 future scenarios representing three annual snowfall totals (red = 25, green = 100, and blue = 175 cm) and four canopy closure conditions (open, thinned, closed, and dense). 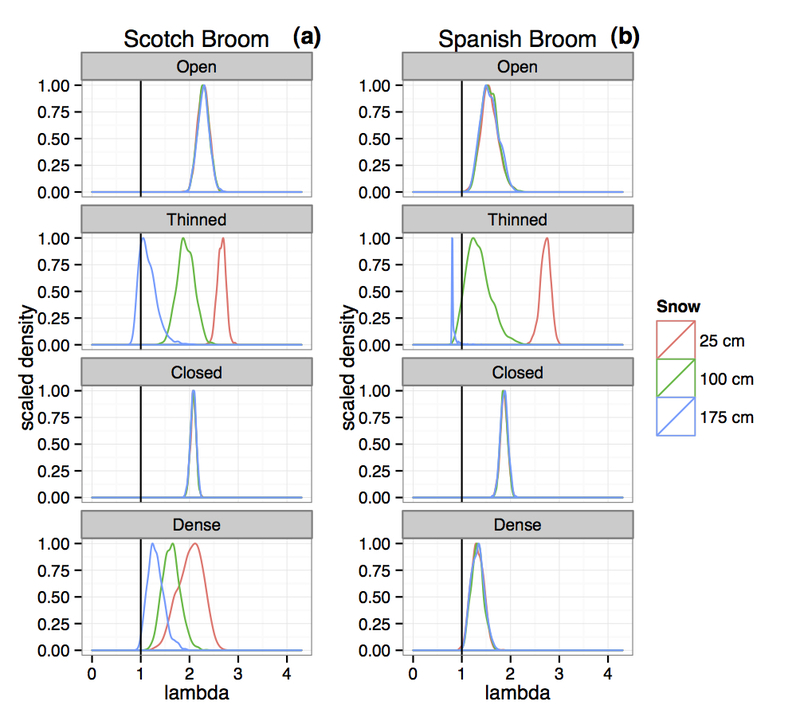 k was generated 1000 times for each scenario based on the distribution of modeled parameter estimates assigned by the model selection criteria in Tables 1 and 2. Vertical black line indicates the threshold for positive population growth (k > 1). 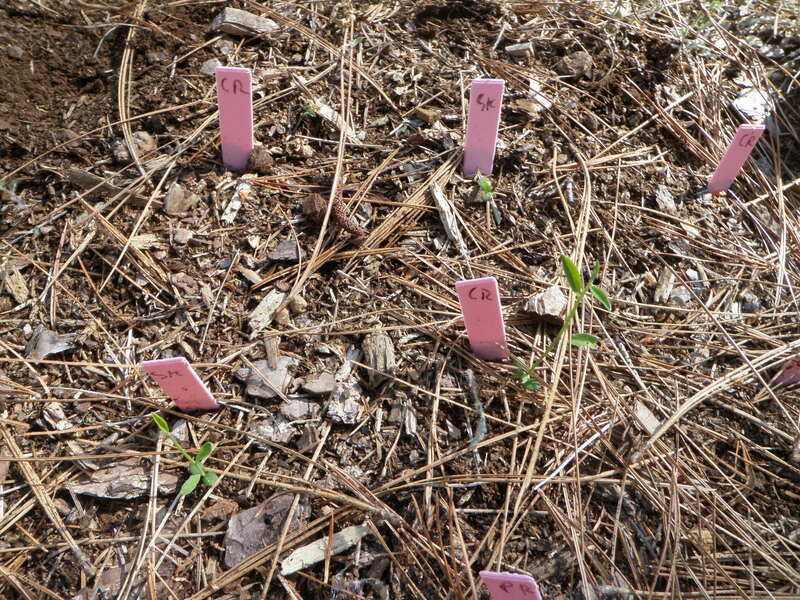 This effect was strongest in thinned forest, where germination and seedling survival were generally higher than in gaps or closed canopy. 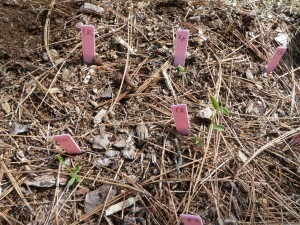 Seedling survival was low in gaps but the few surviving individuals had high growth rates and reached maturity quickly, minimizing the net effect of snowpack. 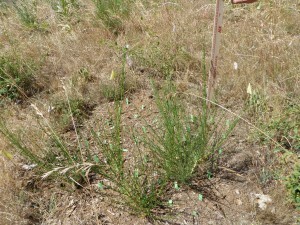 We also simulated different fire-return intervals and found that population recovery during inter-fire periods is enhanced by reduced snowpack, especially for Scotch broom. 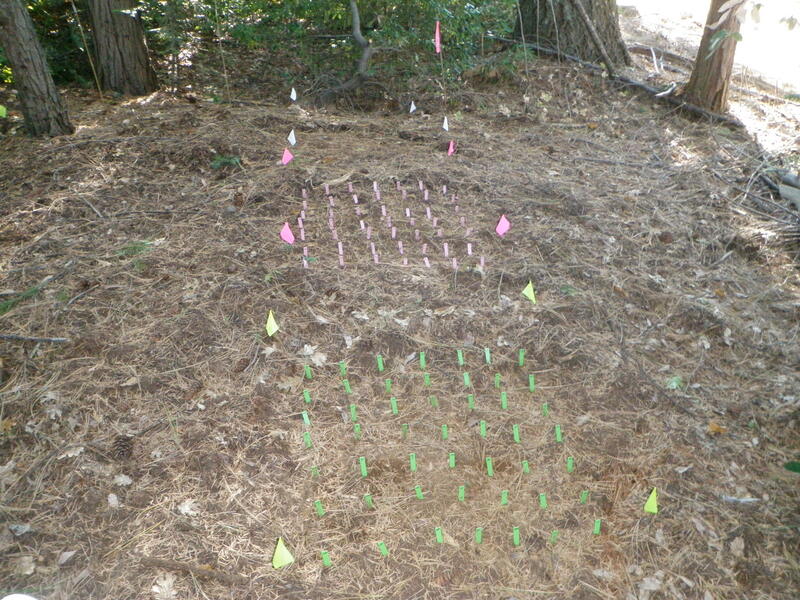 A future of less snow and more disturbance is likely to accelerate up-slope invasions, at least for these species. But the fact that most population growth rates were above 1 suggests that there’s currently some dispersal limitation as well. And if anyone finds broom at Blodgett now, it might be me that owes them beer instead of Rob. Stevens, J. T. & Latimer, A. M. (2015). 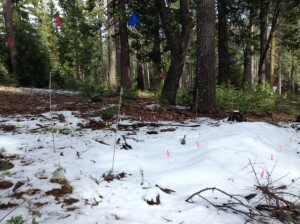 Snowpack, fire, and forest disturbance: interactions affect montane invasions by non-native shrubs. Global Change Biology, 21, 2379-2393.